Andy arrived in Austin in 1981, shortly after completing architecture school and has been practicing his profession here continuously since then. In addition to his ten-year tenure as principal in the award-winning design firm Hinman-Morton-Halford Architects, Andy has served as Senior Designer, Project Architect, and Design Director for several prominent Austin architecture firms. Andrew Hinman Architecture was established in 2004. Andy’s direct involvement with the design/construction process results in a “hands-on” personal approach. He loves the exploration and invention of designing with a client and is actively involved throughout construction, even serving as the general contractor for some of his projects. Andy’s diverse design portfolio includes private residences, recreational facilities, banks, retail/mixed use projects, commercial and public office buildings, educational buildings, medical facilities and churches. His projects have garnered design awards from the Austin Chapter AIA, the Austin Design Commission, and the Austin Business Journal, and, more importantly, praise from satisfied clients. Andy received a Bachelor of Architecture from Mississippi State University and a BA in Philosophy from Millsaps College. He is member of the American Institute of Architects (AIA) and the Texas Society of Architects (TSA). 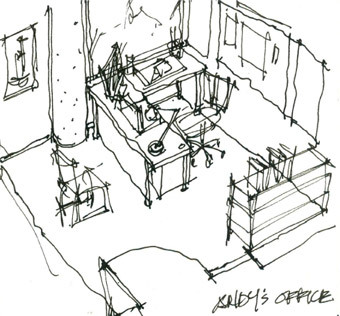 Andy is a Registered Architect (License #10949) by the Texas Board of Architectural Examiners (TBAE). Andy lives in Central Austin in a remodeled 1930’s house with his wife Rebecca Campbell, Executive Director of the Austin Film Society, and as a result, he sees lots of movies.